*Editor’s note: This article was updated 6/11/13 with additional information provided by MnROAD engineers. 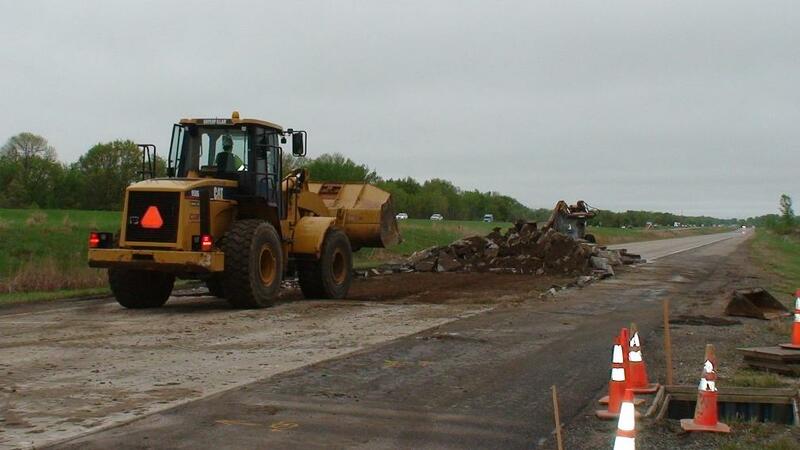 You’re probably aware that MnDOT recently kicked off its 2013 construction season, comprising $1.1 billion in new transportation investments in more than 300 projects across Minnesota. What you might not know is that another MnDOT construction season has begun at MnROAD, the department’s unique, high-tech pavement test facility located near Albertville, Minn.
MnROAD serves as a proving ground for innovative pavement designs, equipment and construction techniques that help transportation professionals all over the world strengthen roads, cut costs, and reduce construction times. It has a two test tracks — a 3.5- mile mainline carrying “live” traffic and a 2.5-mile closed-loop, low-volume roadway — that are used for state, university and private industry pavement research. These tracks are made up of dozens of individual “cells,” which are unique stretches of pavement each representing several research projects. This summer, several test cells are being torn up and repaved. Cell 40, a 20-year-old concrete pavement, will receive an innovative 3-inch thick unbonded concrete overlay. To increase the capacity of such a thin overlay , a fiber-reinforced concrete mixture will be used. To separate and cushion the thin overlay from the existing concrete, two different thicknesses of nonwoven geotextile fabric will be laid. This will help MnROAD researchers to understand how much cushioning is needed, as well as the drainage capacity of each fabric. Fabric interlayers are gaining popularity as an alternative to asphalt interlayers. Thin concrete overlays of asphalt, commonly known as whitetoppings, will also be used to reconstruct Cells 60-63. Similar to Cell 40, fiber reinforced concrete will be used to test its benefit in supplementing load transfer at joints and across cracks. Pavement built with this material will be strengthened by the fiber, prolonging a road’s lifespan, and potentially allowing for thinner concrete pavements. Findings from Cells 40 and 60-63 support the ongoing development of improved design procedures for concrete overlays. Cell 13 reconstruction is using recycled concrete aggregate provided by the contractor’s stockpile from other pavement projects. The concrete from the stockpile will be included in the concrete mix — a new practice to understand how to better recycle paving materials and ascertain the cost and benefits of this practice. Cell 13 will also be testing two innovative types of preformed joint sealants, and several joints drained by geotextile drains. Construction updates are available on the MnROAD website as well as information regarding current research projects. Removing concrete in MnROAD Cell 13.